Finally the day has arrived! Back in 2011, this day I started a blog with just a hope to be there, to be trusted, to be known, to be recognized, just a hope. As the time transcend, I found my self being engaged in the blogging world full-throttle, but in a very very positive way. I enjoy what I do, I say, I get and I give. I'd thank the Al-Mighty for being so generous on me, that He made every endeavor of mine successful and memorable. He has blessed me in so many ways this year from being a mommy second time, to get little achievements in my blogging, which is my passion. 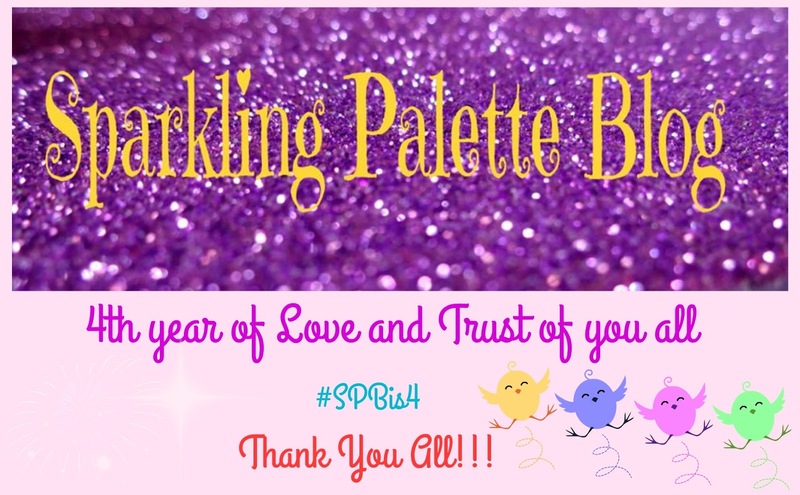 This year I took some bold steps of revamping and re-designing the blog, as I loved venturing into my interests in addition to Beauty and Fashion, so here is a complete blog including Lifestyle, yours own "Sparkling Palette Blog" a palette of everything sparkling! Thanks to my Family, Friends and specially my Followers for being there for me, showing their support and love for my blog, and on my ever active social media (links in the sidebar). A special thanks to the patrons of this blog, the PR companies, the Brands, the Labels, the event organizers and all, local or international, for honoring #SPB for collaborations, I am awed by the trust which is endowed on this Blog. I promise to give quality work, ever excelling and progressive approach to every work coming my way, thus achieving the milestones. Congratulations on completing 4 years, its a great achievement and best of luck for the years to come , wishing you more success in future.